Did anyone catch it? We used the word Divergence in our title, not Convergence, the one every Trade pub on Earth is now blasting from the hills. When I finally did see the disconnect of how ad spots are now being valued, it struck me, natch, that borrowing the now-famous song title for our title, from the long-famous woman artist who first broke big at the Bottom of the Hill club in my old neighborhood of Potrero Hill in the day…was the only one that would work. And it is ironic to me how things work: right as RTB [and its white-hot parent, Programmatic] gain traction & validity, becoming all the rage in a gotta-have-it-now world….Broadcast in one sense has gone totally the other way, and hypes ‘Time-Shifted’ viewing, to maintain legitimacy [and billings] with big agencies and Brands when selling Ad spots. Finally, it is even more ironic…that as of now, the bigger budgets remain largely where they are. Some are dabbling with the go-go immediacy offered in real-time, but most is still allocated as it was, updated to the ‘give it a day, or three, or maybe seven’ new way to measure viewers of Broadcast. There is nothing wrong with this, and there are levels of merit to each of these, but this exact area is one where I see little discussion. Much more from MoM[S] on this subject and its many facets, pro & con, is yet to come. Isn’t It Ironic? It is. How the Digital Age has upended things in the traditional, “normal” world. I believe ‘Disrupted’ is the term in recent vogue, and the one appropriate to this state of being. Nowhere is this more apparent than in the seeming twilight of the once-ubiquitous Yellow Pages, still delivered to nearly every doorstep in America. Why would I say this? From my very own NewsFeed of today, you can see the good YP folks actually advertising for business owners to get free listings! Note I didn’t say consumers; they are going for owners of small businesses. And that NewsFeed I mentioned? That would be on Facebook, of course. That they at YP think this approach makes sense, speaks volumes beyond the space we have here to expound upon. And naturally enough, the FB team sees YP as little enough of a threat, to gladly take their money for this privilege. I almost couldn’t make this up! But again, all of this speaks volumes. Atlas. WhatsApp. LiveRail. All of these have proven brilliant moves. And YP having to take a bow here, is a kind of silent, building result…one we are likely to see more of soon. While I personally am not a fan of Mr Zuckerberg’s seeming penchant for prying into our Privacy, I would admit an admiration for his ability to see & create maneuvers such as this, more or less on his own. That is in stark contrast, to the algorithmic/logarithmic, analytical reality applied at a place like Google, as they look to ‘hire the best’, and yet are not now nearly as well positioned in the near term, as Mr Zuckerberg is. Well played…again…FB. And good luck to you in a new age, YP. It took some time, to figure out exactly how I would honor news of the passing of Dwayne Douglas Allen. Doug hired me for my first job while in college, which also turned out to be my first job in Sales. This was at a time when I had no idea that I could sell, and had no idea it could [or would] turn into a lifelong career…my lifelong career. It is the same career I write in depth about here at MoM[S]; a career I dearly love. Doug saw something in me then, believed in me, and then we kept in touch from that day on. Dwayne Douglas Allen was my boss first, then a mentor, an advisor, and then eventually until his passing, a lifelong friend. The many postcards, letters & other memorabilia from him are items that I keep to this day, and will value forever. We shed a tear at your passing, Doug, and will grieve for some days to come as we think of you. But we will always remember the countless chats, visits & laughs we had over many years. God Bless, and Rest in Peace, my old friend. The shot captured here will apparently be the final cover ever published from the San Francisco Bay Guardian, one of the great bastions in the country for progressive, alternative journalism. Very sad to see this. Even more sad…with MoM[S] having long been a student of media as well as a practitioner…is that this day was pretty much baked more or less for both the BG, as well as that other great liberal bastion, New York’s great Village Voice, as soon as the lovely folks from New Times reared their heads in the world out of Phoenix, to the regret of so many. Basically following radio’s acquire/purge/hollow-out model from Clear Channel, the result is now more than clear. Yes, the web also put major pressure on books like the Bay Guardian, sure, but the legacy, and M.O., of the New Times crowd was well-known even before their disgraceful buy of the Voice, and even longer before the successful lawsuit against them in SF…set as it was, against teary, bogus ‘testimony’ from corporate [as I would allege all of this to be, as depicted.] Please. From town to town, we had long read about their alleged thuggish, scorched-earth policies as employed by New Times. Not only against their competitors [resulting in the lawsuit above], but their very employees & reporters. Journalism has always been rough & tumble. Ad sales, or selling Media in general, has never also been for the faint of heart. Yet you will notice that this very blog, MindOnMedia[Sales] has never advocated such practices as we read about in that lawsuit. Nor have we ever felt a need to engage in them ourselves, and yet we’ve been fortunate to experience what is arguably a reasonable successful career. One we are still enmeshed in, every minute of our life. In the end, a free & independent press is more important to this country than any $2M moron on Wall Street, or self-important hack in DC, could ever imagine. Nothing is more important to this great country, except possibly the document that allows a free press to always be extant, the US Constitution. 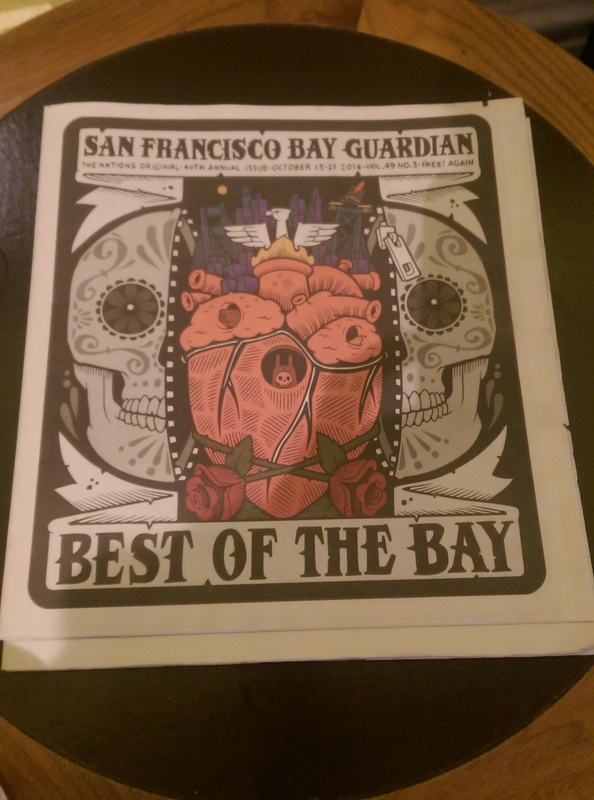 We salute the Bay Guardian, brave & unwavering from its first day until its last. May independent journalism find a way to carry on against corporate tyranny and government thugs forever, always. With the looming automation of…well, everything…it makes sense to me now that to succeed in Sales going forward, is to be anything BUT automated. And a lot of that has to do with the way you sound, what you say, and how you come across. A ‘first impression’ yes, but more than that. Which indirectly, leads us to this recent article, and the momentary swirl it created surrounding a PR giant, Edelman, over a blog post related to a very tragic event [which we will not actually name in this writing, for reasons stated below.] See it here. There are many ways to say things, and sometimes you just need a filter, a bit of reflection, or some sensitivity. We all do. The writer of the linked blog post clearly did in my view. While sales people can often be seen as manipulative or lacking grace, they can also alienate if they go for too much jargon, as was the case here on the PR side, I would assert. Consider that context is everything if you would, and like it or not, the final arbiter is your recipient; whether an audience, your client, or a potential customer. In the case of Edelman with this, the ‘insider’ jargon; the context of what was being written about; was taken in a completely OTHER context than perhaps intended, which was not realized at the time. So much for “PR”, from a world-class PR firm. While I give them credit [sort of, narrowly] for holding their ground in one sense on exactly the meaning they had intended, they bomb out hugely for not realizing how this would come across outside their own defined orbit. Using the word ‘opportunity’ as they did, may have made sense internally…but only in a very small circle. A bit tone-deaf if you ask me, at a very inopportune time. Their audience: those same client[s], prospect[s], the public at large mentioned above, all took this a different way, and frankly, Edelman should have easily avoided such a scenario. It is after all, what they purport to advise their very clients on. Doesn’t the same apply to other areas of life, including how you deal with your own clients? Put yourself, mentally, on the ‘other’ side, as Edelman should have. The side where your audience/client/prospect sits. Leave all the jargon, talking points, “closing” tactics aside, and THINK about where your client is, and what they want/need to hear. And be mindful: To become neutral for an exercise like this, is actually much harder than it appears. Project how what you say & do will be received by them, in all the ways you can imagine. Then vary it, mix it up, and make changes to both parts, viewing it from as many angles as possible. Now, while you could note that I am perilously close to the appearance of glomming-on to what is [already] a terrible tragedy & series of events following [awful in several ways], you should also note:  the title here gives no hint to it being related to these occurrences, and deliberately so,  The name of the person involved is not mentioned anywhere in this post [except inside the article link], avoiding most obvious ‘link-bait’ possibilities which could drive traffic to this blog, also deliberate,  Edelman is also not in the headline/subject, appearing in the 2nd paragraph, and  the fervent attention about this tragedy has somewhat cooled, allowing for review of all parts of what occurred here, for potential learnings by all. So…how did THIS come across, to you? Any glaring words I missed/misused, that don’t reflect their intended meaning? I certainly hope not in this, of all MoM[S] postings. I don’t often re-blog the work of others, but occasionally one comes up, that captures the essence of what we write here at MoM[S], even if in a different way. Enjoy! Are You Willing to Put in the Effort? | Fearless Selling Kelley Robertson. The Digital Analytics Association [DAA for short] is launching this year what they call their ‘Most Important Project of the Decade‘, known as the Digital Competency Development Project. We support this worthy cause, not just because of the endless reports week after week in the Trades about ‘bot fraud, phantom domains/traffic, iFrame stacking, and on & on. The more professional standards put into place by leading industry groups at this point in time, the better for everyone working in the Digital space. In fact, we have put our “support” into tangible form, having been selected to be a part of this project as a Subject Matter Expert for the concepts proposed & developed to become the defacto standards of the DAA & its professional members. MindOnMedia[Sales] is honored to have been chosen here, and hope to provide valuable insights in this worthy cause!